Strengthening Toyota’s presence in the D/E sedan segment, the new Camry Hybrid represents a unique offer thanks to its powerful, self-charging hybrid electric powertrain. The new sedan expands Toyota’s European line-up of hybrid electric vehicles to eight models. The new Camry Hybrid’s 2.5 litre Hybrid Dynamic Force powertrain combines fuel efficiency, low emissions and quiet operation with more power and greater responsiveness. Delivering160 kW/218 DIN hp, the Camry Hybrid generates CO2 emissions as low as 98 g/km(WLTP: 119 g/km) and returns combined fuel consumption of only 4.3 l/100 km1. 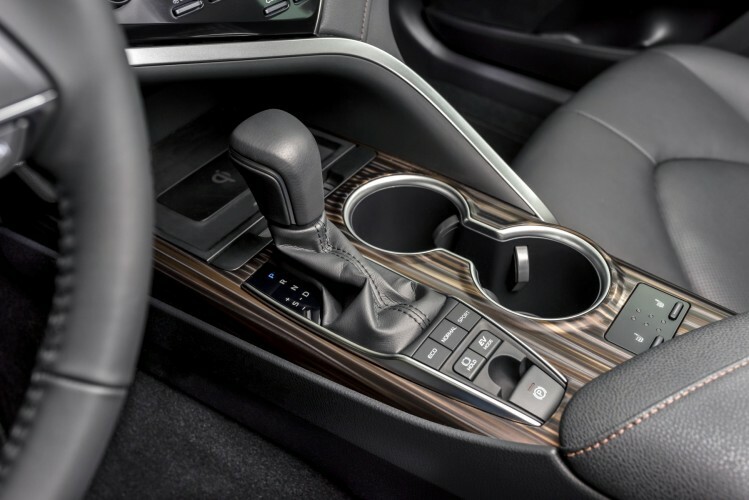 The new Toyota Hybrid System (THS II) includes new Sequential Shiftmatic technology that allows the driver to ‘shift’ with the console-mounted lever, mimicking a conventional six-speed automatic transmission for a more engaging driving experience. The all-new Camry is the 8th generation of a model that has won countless awards and distinctions since it first went on sale in 1982. The car is sold in more than 100 countries globally, with sales totalling over 19 million units to date. With annual sales of more than 700,000 units, Camry remains the best-selling D/E segment sedan in the world. The latest generation Camry is a product of the Toyota New Global Architecture (TNGA) design and engineering philosophy. TNGA places enthusiast-oriented ‘fun to drive’ characteristics and alluring styling on an equal footing with excellent build quality, reliability and safety. One of the key benefits of adopting the new GA-K platform is that it has given Toyota the opportunity to completely re-evaluate every aspect of mid-sized sedan design, packaging and engineering, from the ground up. This has led to an unprecedented level of change for the Camry model range in just one generation, with virtually no carry-over of components in the areas of Styling, Human Machine Interface and cockpit design, powertrains, ride and handling, and safety. Since its inception, the development of the all-new Camry has been based on two key pillars: Performance (driving dynamics, NVH, QDR and packaging), and Intelligence (high-tech specifications, comfort and safety). The new Camry Hybrid’s wide, low and aerodynamically efficient design features confident, distinctive styling that incorporates a further evolution of Toyota’s Under Priority and Keen Lookdesign philosophies. 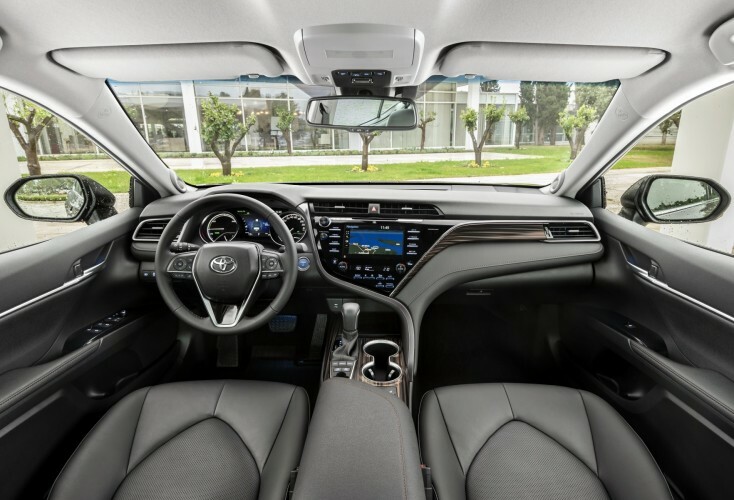 Within a cabin, in which the reduced height of both floor and seats bring the drivers hips close to the Camry’s centre of gravity, the interior design represents an ideal fusion of style, comfort and craftsmanship. The sensuous curves of the dashboard enclose an ergonomically ideal, driver-focused cockpit environment. The front seats offer excellent comfort and support, and rear accommodation is available in a choice of 60:40 split/folding or 40:20:40 split, power reclining seats. All switchgear has been designed to offer optimum functionality, appearance and tactility. And the new Camry’s Human Machine Interface (HMI) features a trio of easy-to-read, information-coordinating displays consisting of: a high visibility, colour, 10″ Head-up Display (HUD); a 7″ in-meter Multi-information Display; and an 8″ centre console display incorporating Toyota’s Touch®2 with Go multimedia system. Whilst retaining all the core values that have made it so popular to date -segment-leading levels of QDR (quality, durability and reliability), quietness and ride quality- the all-new Camry provides the driver with head-turning new exterior and interior design, innovative technology and safety features, and newfound levels of driving satisfaction and excitement. Camry is a very important model for Toyota globally. Since the first generation went on sale in 1982, more than 19 million Camry’s have been sold. In addition to Toyota‘s strength of QDR (Quality, Durability and Reliability), great fuel efficiency and good driving dynamics have always supported the Camry. Not to mention the class-leading quietness and ride quality. However, the market continues to evolve, and in order for the Camry to maintain its global appeal, we cannot settle for the success of the past. We must continue to challenge and create an attractive car for the next era. Therefore, unlike the model changes up to now, this 8thgeneration Camry has been developed from the ground up. The development concept is ‘Unprecedented Change’ in which ‘Performance’ and ‘Intelligence’ have been optimised to produce a sedan that gives people an elevated level of engagement and well-being. Performance refers to the fundamentals of a car, which includes driving dynamics, spaciousness, and fuel economy. Intelligence refers to the innovations and ingenuity that allows for the convenient and satisfying use of the car. Development of the new Camry has been enabled by the Toyota New Global Architecture (TNGA) philosophy. It aims for making ‘ever better cars’, while taking advantage of Toyota’s strengths of Kaizen (continuous improvement) and Innovation. The all-new TNGA-based body and platform have resulted in a new dimension of design freedom, including a long wheelbase and wide stance that realise a stylish and sporty design. In addition, the floor and hip points have also been lowered, making it possible to create an eye-catching, emotional silhouette and achieve an optimal driving position. The new 2.5 litre Hybrid Dynamic Force powertrain offers impressive fuel economy and driving dynamics that follow the driver’s intentions. With the help of TNGA, we are setting a new standard for our cars. I am convinced that, once you see, feel and drive the new Camry, you will surely understand the difference it makes. And why I am convinced that it will bring smiles of satisfaction to all of its future owners. The new GA-K platform has facilitated a wide, low and aerodynamically efficient design. A markedly low roofline and bonnet height are complimented by a short front overhang which allows for the placement of each wheel as close to the corners of the vehicle as possible, giving the new Camry Hybrid a wide, purposeful stance. Both the cabin floor and the front and rear passenger seat hip point heights have been set as low as possible, lowering the new Camry’s centre of gravity. And, within the long wheelbase, both front and rear seating hip points are positioned to optimising the driving position and front seat space with no loss of rear seat accommodation. The new Camry Hybrid’s styling has a bold and distinctive appearance that seamlessly fuses athletic accents and creases within the sheet metal with a sleek, sensual form that speaks of the confidence and refinement. The front represents a bold evolution of the company’s Under Priorityand Keen Lookdesign language –Catamaran Under Priority. A slim, wide and deep upper grille emphasises the Toyota emblem and incorporates thin headlamp clusters at its extremities. The clusters feature LED lamps and highly distinctive Daytime Running Lights (DRL). The large, trapezoidal lower grille occupies almost the full width of the bumper area. 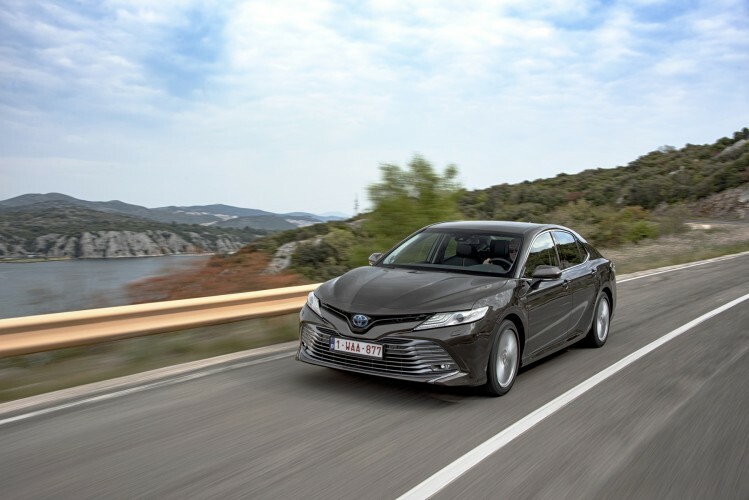 Only the bumper side corners remain, sandwiching the grille in a manner reminiscent of the twin hulls of a catamaran and emphasising the wide track and broad, purposeful stance of the new Camry. The horizontal surfacing of the lower edge of the bumper corners flows from the rocker panels and locates the sporting front spoiler, further reinforcing the vehicle’s low, ground-hugging credentials. The lower grille itself features horizontal bars which have been meticulously crafted to strengthen the visual power of the Catamaran Under Prioritydesign and add both aggression and prestige to the wide, low frontal styling. The powerful belt line combines with the prominent rocker panels and a rising diagonal that flows from the centre of the front wheel through the top of the rear wheel arch. This both creates a strong dynamic axis through the body and firmly plants the tyres on the ground. A flared wheel arch design uses the available width of the vehicle to maximum effect, further highlighting the vehicle’s stable, sporting footprint. The rear half of the cabin tapers inwards, tucked between the broad, protruding shoulders of the rear wheel arches. Below, bumper-enveloping ‘aero’ corners flow from all-LED tail lamp clusters to further emphasise the new Camry’s wide, sports-influenced stance. Throughout, the interaction of sharp, accentuated lines, taut, solid panels and voluptuously curved surfaces gives the new Camry a uniquely refined yet sensual athleticism worthy of a premium class sedan. The new Camry Hybrid is available with a choice of 17″ and 18″ alloy wheels, and eight body colours. The interior of the new Camry Hybrid has been designed to offer a carefully considered fusion of function, style and craftsmanship. The sensuous curves of the dashboard combine an ergonomically ideal, driver-focused cockpit environment with spacious, comfortable passenger accommodation. Together, the seamlessly integrated component layout, painstakingly crafted textures and consistency in the use of materials create a cabin of outstanding quality and prestige. The thickness of the dashboard has been reduced. This, in conjunction with the low bonnet, cowl and belt line height, a slim A pillar design and the door mounting of the exterior mirrors, offers drivers excellent forward visibility and superior all-round vision. This extensive field of vision has been further enhanced by the adoption of a new front windscreen wiper system which, in ‘Lo’ mode, automatically enlarges the wiped area around the A pillars for even better visibility. The leather wrapped steering wheel features switchgear for the operation of the Multi-information Display and driving support controls. It offers expansive reach and rake adjustment, and power operation, with a memory function, is available. The audio system, air-conditioning control panel and 8″ infotainment system screen have been fully integrated into the completely flush, piano black surface of the wide, tall centre console with no gaps between the controls. Fully described in the Technology and Innovation chapter, the new Camry’s segment-unique Human Machine Interface (HMI) features a trio of easy-to-read, information coordinating displays consisting of: a high visibility, colour, 10″ Head-up Display (HUD); a 7″ in-meter Multi-information Display; and an 8″ centre console display incorporating Toyota’s Touch 2 with Go multimedia system. The switchgear has been designed for superior functionality, appearance and tactility. All controls have been carefully shaped and ergonomically optimised, including the high-quality satin metallic switches. Seamless texture and finish quality throughout the instrument panel epitomises the Camry Hybrid’s high levels of interior precision. The spacious cabin is finished in high-quality soft-touch padding, supple leather, elegant wood-like grain mouldings or a lustrous, newly developed satin chrome trim. A new Tiger Eye ornamentation trim is available, offering a sense of depth and shine that varies with the viewing angle in the manner of the tiger’s eye gemstone. Premium-quality indirect cabin lighting illuminates both the driver and front passenger footwells, the glovebox interior, and the front console storage area forward of the gear lever, which also lights the accessory socket and USB port. The new Camry interior is available in two colour schemes: Beige leather -which combines a dark grey carpet and upper dashboard with two shades of beige; and Black fabric or leather which highlights the interior new satin chrome accents. In response to the superior levels of handling agility delivered by the new GA-K platform, the front seats have been designed to combine improved support and lateral holding ability with less fatigue. The seat back features a wide shoulder area and an enveloping shape with excellent lateral support, more akin to that found in sports cars. The support offered by the seat base has been maximised through the adoption of a thicker urethane pad under the ischial bone, a thin urethane pad behind the pelvis, and the moving forwards of the rear support rod to increase supportive pressure. In order to create a more comfortable driving posture with less stress on the lower back and muscles and, hence, less fatigue, the seatback springs have been moved rearwards. 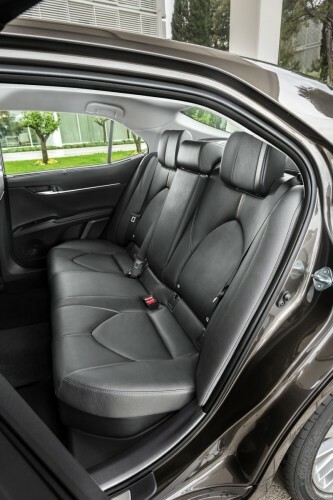 In addition, increased rigidity at the bottom of the seatback springs and at the rear edge of the seat cushion springs helps prevent the occupant’s posture from shifting. A front seat slide adjustment range of 260 mm guarantees drivers an optimum seating position, while power adjustment and seat heating are available for both driver and front passenger. Replicating the design of the front seats, rear accommodation is available in two formats; 60:40 split/foldable seats, and 40:20:40 split, power reclining seats with wide headrests. The large surface area of the rear seat centre armrest offers enhanced comfort. The power reclining seat format is available with a capacitive touch control panel built into the front of the centre armrest, allowing for the rear seat operation of the air conditioning, audio system and seat reclining controls. Finally, the adoption of a rear double wishbone suspension system reduces shock absorber incursion into the loadspace of the new Camry Hybrid, offering a luggage capacity of 500 litres for vehicles equipped with power reclining rear seats, and 524 litres for those with 60:40 split seating. The new Camry Hybrid’s class-leading Human Machine Interface (HMI) features a 7″ in-meter Multi-information Display, a 10″ colour Head-up Display (HUD), and an 8″ centre console display incorporating the Toyota Touch® 2 multimedia system. The HMI features a new, expanded multimedia linkage function. In addition to the previous multimedia linkage and audio switch operation feedback display, phone call and voice recognition displays have been added. This enhanced linkage function enables a large amount of information to be shown in the Multi-information Display, such as mobile phone caller information and audio track titles, whilst minimising the driver’s eye movement necessary to confirm operation. Located in the driver’s instrument binnacle between the high-visibility Optitron tachometer and speedometer dials, a 7″ TFT Multi-information Display has been integrated, available in more than 20 languages. The new 7″ display’s graphics use perspective to create depth so that the system can depict actual road and vehicle conditions in an intuitive and easy-to-understand manner. It is possible to split the display area, change the display size, and change to a tabbed display making the information easier to read. By use of a steering wheel switch, the currently displayed tab may be changed between numerous categories including fuel efficiency, driving support and navigation, audio information, vehicle information and settings. The new Camry Hybrid may be equipped with a 10″ colour Head-up Display (HUD) which projects a range of driver support information onto the bottom of the windscreen glass. By only displaying relevant information, the HUD reduces distraction for the driver and allows him to keep his hands on the wheel and eyes on the road. The HUD projection is divided into four zones: a central Normal display area and an adjacent Multi-display area, an upper Interrupt message display area, and a lower Interrupt message display area. The Normal display area shows basic driving information such as speed and shift lever position. A wide variety of information may be shown in the Multi-display area, including turn-by-turn navigation, a compass, and cruise control and Lane Departure Alert system status. The lower Interrupt message display area notifies the driver of incoming phone calls, audio system information and outside temperate alerts, whilst the upper Interrupt message display area shows Toyota Safety Sense system warning messages. The new Camry’s 8″, full colour, touch-screen centre console display features the Toyota Touch® 2 multimedia system. It is equipped with a full colour WVGA screen, mirror link mobile phone compatibility and slide operation for ease of use. Available in more than 20 languages, Toyota Touch®2 incorporates radio, Bluetooth mobile phone connectivity with an SMS on-screen send/receive function incorporating a contact person image display, a music streaming facility, and a USB port for the connection of portable music players, with the facility to display iPod album cover art. A rear view camera is fitted as standard. The multimedia system can be upgraded to Toyota Touch®2 with Go. This full map navigation system comes equipped with 3D city models, landmark graphics, traffic visualisation, an SOS/emergency call assistance function, a ‘text-to-speech’ message readout facility and access to the online Toyota customer portal. The system will display emails and calendars depending on Bluetooth mobile phone compatibility. Toyota Touch®2 with Go supports Wi-Fi connectivity, allowing users to set up their smartphones as a Wi-Fi hotspot for connection to the system’s online functions. Further system access to online content and apps includes access to fuel prices, weather and parking space information. With a choice of 17 languages, the Advanced Voice Recognition function has been designed for the simplest possible operation whilst driving. Focusing on three key tasks, it allows the driver to input a full destination, make a phone call, or to pick a specific song from a connected iPod with a single voice command. Toyota Touch®2 With Go includes three years free map updating and can be easily upgraded with the newest functions, updated maps and the latest Apps, as they become available. The new Camry Hybrid may be equipped with a three-zone air conditioning system, providing the independent driver, front passenger and rear seat temperature control appropriate to a prestige sedan. The air conditioning system incorporates a nanoeTMtechnology system. This air cleaning technology operates automatically when the ventilation is turned on. It releases 5 to 20 nm nanoeTMparticles -negatively charged ions wrapped in water molecules- into the cabin via the driver’s side dashboard air vent. nanoeTMmoisture content is approximately 1,000 times that of conventional ions, and the particles have mildly acidic properties. As a result, nanoeTMparticles have a gently moisturising effect on skin and hair, whilst creating a crisp and refreshing interior atmosphere. The new Camry’s standard 6-speaker audio system may be upgraded to a 9-speaker JBL Premium Sound System which has been specifically tuned for installation within the new Toyota sedan. At the heart of the system is a Class D, eight channel JBL amplifier which combines a high output with reduced power consumption. The amplifier drives nine highly efficient JBL speakers which include 25 mm horn tweeters integrated within the A pillars, and a new 265 mm sub-woofer located beneath the loadspace floor. The system incorporates ‘Clari-Fi’ technology which supplements the frequencies that are lost on compressed audio files -such as MP3 or streaming audio files- in real time, restoring the sound quality and stereo mix as closely as possible to the original recording. A wireless charging system allows vehicle occupants to recharge their mobile telephones simply by resting them on a dedicated pad located in front of the gearshift lever. The system technology will recharge all devices that are compatible with the Wireless Power Consortium (WPC) wireless charging standard ‘Qi’. New Sequential Shiftmatic quick-shifting six-speed technology for spirited performance and driving enjoyment. The new Camry Hybrid’s 2.5-litre Hybrid Dynamic Force powertrainfulfils all the requirements that customers have come to expect from a Toyota self-charging hybrid powertrain -quiet, intuitive, responsive and self-sufficient EV technology with no need for plug-in recharging. It offers low cost of ownership, outstanding fuel economy and low CO2 emissions, and up to 50% zero emissions driving on the everyday commute. Combining more power and greater responsiveness with low emissions and superior fuel efficiency, the new full hybrid powertrain delivers160 kW/218 DIN hp. It will accelerate the Camry Hybrid from 0 to 100 km/h in 8.3 seconds and on to a maximum speed of 180 km/h, whilst generating CO2emissions as low as 98 g/km and returning a combined fuel consumption of only 4.3 l/100 km. Providing high power output with smooth and highly refined operation, the new 2,487 cc four-cylinder Dynamic Force Engine has a maximum power output of 131 kW at 5,700 rpm and develops maximum torque of 221 Nm at between 3,600 and 5,200 rpm. The unit’s long 103.4 mm stroke and high 14:1 compression ratio deliver high fuel and thermal efficiency, and it boasts world-beating maximum thermal efficiency of 41%. It incorporates an array of Toyota’s most advanced technologies including D-4S (Direct injection 4-stroke gasoline engine Superior version), Dual VVT-i with VVT-iE (Variable Valve Timing intelligent system by Electric motor) and laser-clad valve seats to deliver a sophisticated blend of improved output, fuel efficiency and emissions performance. High efficiency intake ports benefit from an enlarged valve nip angle and laser-clad valve seats on the intake side in order to boost intake port efficiency, delivering both a high tumble ratio and high intake volume. This creates more stable combustion, contributing to improved output and increased fuel efficiency. D-4S features new multi-hole (six hole) nozzle direct injectors to combine enhanced output and fuel economy with clean emissions. The system uses both Direct fuel Injection (DI) and Port Fuel Injection (PFI), adopting the appropriate injection method in accordance with driving conditions to maximise output power fuel economy and environmental friendliness. The unit also adopts Dual VVT-i with VVT-iE on the intake side and VVT-i on the exhaust side. VVT-iE (Variable Valve Timing intelligent system by Electric motor) uses an electric motor instead of oil pressure to control the variable valve timing, allowing it to deliver high fuel efficiency and low emissions even when operating at low rpm or in cold temperatures. An increased range of variability for both intake and exhaust valve timing further increases both fuel efficiency and output. A Cooled Exhaust Gas Recirculation system (EGR) combines EGR gas cooling inside the cylinder head with a highly efficient EGR cooler for improved fuel efficiency. Improved EGR cooling performance makes it possible to introduce EGR gases during high-rpm, high-load operation, further increasing fuel efficiency. The Camry Hybrid uses an electrically controlled variable-discharge oil pump. This pump reduces friction by optimising oil pressure and volume in response to the engine oil temperature and engine rpm. With no need to use oil jets to cool the pistons when the engine is cold, the system adjusts the oil pressure and stops the oil jets, enabling the engine to warm up faster with lower emissions. Finally, a variable cooling system employs an electric water pump, an electronically controlled thermostat and a Flow-Shutting Valve (FSV). The volume of coolant that flows to the engine, radiator and cabin heater core is optimised using electronic control to deliver the optimum mix of faster warm-up and cabin heating. The thermostat’s open-valve temperature is further lowered during high-rpm, high-load operation in order to prevent engine knock and increase output. The enhanced Toyota Hybrid System (THS II) has been designed to deliver a sophisticated blend of dynamic performance and fuel efficiency. Improvements to the conversion efficiency of the Power Control Unit (PCU) and the transmission efficiency of the transaxle and motor combine to reduce system energy losses by some 20%. The hybrid system features a smaller, lighter transaxle in which a new, dual axis structure adopted for the motor and generator achieves a low-loss gear train with a smaller overall width. This parallel axis structure both increases the motor’s rotation speed and reduces its size. Within the PCU, reductions in power stack element loss and improvements in cooling system efficiency reduce energy losses by about 10%. The integration of microcontrollers and the use of a new power stack structure has created a more compact and lightweight PCU that can be installed directly above the transaxle, contributing to a lower bonnet height. The design of the DC-DC converter output filter has been optimised, achieving further space savings and lowering noise. The lower limit of the DC-DC converter output voltage has been extended and control output optimised, reducing vehicle power consumption. And optimum control of the AC conversion unit results in even higher system efficiency. A newly developed Ni-MH battery has been adopted to combine high performance with a smaller, lighter package. This has enabled the battery to be relocated from the luggage compartment to under the rear seats, not only freeing up additional luggage space, but also lowering the vehicle’s centre of gravity and enhancing handling stability. ADrive Mode Select switch enables the driver to select a choice of ECO, NORMAL and SPORT driving modes. All three modes may be used when the vehicle is operating in the separately-switchable EV mode. In addition, the enhanced self-charging hybrid system also includes new Sequential Shiftmatic technology that allows the driver to ‘shift’ with the console-mounted lever, mimicking a quick-shifting six-speed automatic transmission, for a more dynamic, engaging driving experience. Finally, a new Auto Glide Control (AGC) function allows the new Camry Hybrid to decelerate more slowly than during normal driving, such as when it is coasting with the accelerator pedal released approaching a stop light. Thus, AGC contributes to improved fuel economy by reducing the need for re-acceleration. The AGC function is automatically cancelled on downward slopes or when the brake pedal is depressed, and an AGC indicator in the instrument binnacle Multi-information Display operates to inform the driver that less deceleration torque than normal is being applied. Key to the new Camry Hybrid’s enhanced dynamic abilities and superior ride quality is an all-new, GA-K platform-based bodyshell. Its lightweight, highly rigid structure offers superior torsional rigidity. And body adhesives have been incorporated at key joining points throughout the body shell to maximise joint rigidity. A new process has been used to securely join the side member outer reinforcements at the joints between the front pillar and rail, front pillar and rocker, centre pillar and rail, and centre pillar and rocker, as well as the rear rail joint and rocker rear end construction, thus creating an annular frame construction. A closed cross-section construction has been adopted for the front suspension tower brace and cowl body to increase frame joint rigidity. The front of the vehicle also features a radiator support V brace, outriggers, a suspension tower brace, and increased apron suspension tower and apron upper member rigidity. In the cabin area, the central tunnel height has been optimised, the front seat rail is fastened directly to the body, and the adoption of a continuous flange across the seat cross members and a drawing press front seat rear bracket all maximise body rigidity. Roof and rail joint rigidity has also been optimised through the use of spot welding. To the rear, the frame has been given an annular construction, whilst, in combination, bracing to the rear suspension member installation points, the addition of an underfloor cross member and the strengthening of rear cross member joints increase the lateral stability of the rear suspension system. A newly developed, four-point engine mounting system has been designed to not only dramatically reduce engine vibration but also further increase the Camry Hybrid’s rigidity and handling stability. The front and rear mounts are fastened to a vibration damping sub-frame, whilst the left- and right-hand mounts are installed on side members. By effectively surrounding the engine and transmission, this design reduces vibration generated by the engine starting. The use of side members for the left and right engine mounts increases lateral support rigidity, helping to enhance handling stability. The Camry Hybrid’s suspension features a MacPherson strut configuration at the front and a new double wishbone layout at the rear. The systems have been engineered to give not only superior stability and flatter cornering to inspire driver confidence, but also to deliver a premium ride quality that surpasses that of other vehicles in the class. Both front and rear systems make use of newly-developed shock absorbers with saturation-type valves that have been tuned to provide the ideal balance of optimal damping force -for stability and dynamic handling- and exemplary ride comfort. The front suspension employs large castor angles with short coil springs and a low placement of the upper support, creating a compact system which allows for a reduced bonnet height. An increased castor trail not only improves straight line stability but also enhances steering response. And the adoption of a strut bearing mounted coaxially with the king pin axis creates a more comfortable steering feel. The wide spacing of the left and right stabiliser bushes increases roll rigidity and steering response as well as offering better straight line stability. The bound stopper characteristics have also been optimised to deliver class-leading vehicle stability during cornering, and reduced jolting when driving over rough surfaces such as speed bumps. The suspension arms, bushes and shock absorbers of the rear double wishbone system have been positioned to maximise the reduction of vibration generated by rough road surfaces, with the shock absorbers moved towards the front of the vehicle to increase luggage space. Bushes have been placed on all suspension arm joints to reduce high frequency vibration for better NVH characteristics. The trailing arm has been installed higher so that the pivot axis of the tyre motion is tilted rearwards when travelling over uneven road surfaces, and the trailing arm bushing has been softened to reduce shock. As with the front suspension, the bound stopper characteristics have also been optimised to deliver class-leading vehicle stability during cornering, and smoother upward suspension travel for reduced jolting over bumps. The new Camry Hybrid’s steering system has been designed to offer improved feel as well as increased comfort and less driver fatigue through better ergonomics. Adopting a steering rack with a parallel-mounted electric motor, the new Electric Power Steering (EPS) features a vehicle speed-sensitive function that allows for light steering effort at low vehicle speeds whilst adjusting at higher speeds to offer more precise feel and quicker response during spirited driving. Available with power reach and rake adjustment and a memory function, the large steering column adjustment range accommodates a wide range of body shapes and driving positions. The grip cross-section and firmness of the wheel itself have also been designed to offer a sporting feel. Combining 328 x 28 mm ventilated discs with a floating calliper at the front and 281 x 12 mm solid discs with a floating calliper at the rear, the new Camry Hybrid’s brake system has been engineered to provide excellent braking power and better vehicle stability under braking. The new hybrid’s composure under braking has been enhanced by the optimisation of braking force, with rear lift suppressed by increasing the rear suspension’s anti-lift angle. To enhance brake pedal feel and feedback, the brake pedal ratio has been increased when the pedal is first pressed, delivering effective braking force with only a light touch. The pedal ratio reduces as the pedal is depressed further, with the resultant pedal stroke becoming more rigid in feel -perceived by the driver as increased resistance to additional pressure. The pedal itself features a rounded sidewall for easier operation and improved ease of switching between accelerator and brake pedals. Building on its hybrid powertrain’s reputation for smooth, quiet running, the new Camry benefits from numerous new NVH (Noise, Vibration and Harshness) countermeasures of a form previously found only in luxury vehicles. These include engine compartment sound absorption and insulation through the use of a bonnet insulator and front wing upper and lower separators. The cabin is further insulated from engine and road noise through the use of a thicker dash silencer mat across the entire firewall section, a urethane upper back silencer, and foam and vibration damping materials placed in numerous locations throughout the cabin frame. A vibration-damping coating has been applied to a wide area of the vehicle underfloor. A floor silencer that is separate to the carpet has been adopted over a large area. And Thinsulate noise-proofing material has been installed over a wide area of the cabin ceiling. In addition, NV bulkheads have been added to the rear wheel housing inner and the rear suspension member, and the size of the rear suspension body mounting bush increased. Finally, wind noise has been suppressed through a narrow door frame design, a newly designed windscreen rain gutter moulding and a reduction in the size of the step at the foot of the windscreen. Some of the most ambitious aerodynamic objectives for any sedan have been achieved through the new Camry Hybrid’s distinctive styling. The bonnet, front fenders and front spoiler have all been shaped to optimise the flow of air both over and underneath the vehicle body. The silhouette of the cabin has been also shaped to optimise the flow of air from the roof to the rear of the vehicle. The trim on the leading edges of the side windows where the A pillar and glass meet at their lowest point have been designed to minimise the gaps between them, smoothing airflow as it moves between the A pillar and door mirror. The rear corner edges of the new Camry have been shaped to prevent air flowing from the rear of the vehicle creating turbulence, and extensions to the trailing edge of the rear bumper further prevent the creating of vortices. The underside of the vehicle features a full under floor cover and spats in front of the front wheels. In conjunction with further aero stabilising fins positioned on the leading edges of the front window trim and the sides of the rear combination lamps, these measures contribute to excellent handling stability. The new Camry Hybrid is equipped with ‘Toyota Safety Sense’, a set of active safety technologies designed to help prevent or mitigate collisions across a wide range of traffic situations. Further driver support and safety enhancing systems include a Blind Spot Monitor (BSM) with Rear Cross Traffic Brake (RCTB), Drive Start Control (DSC), front and rear Intelligent Clearance Sonar (ICS), a Back Monitor with parking guidelines, and a full suite of brake and traction control systems. Combining a camera and millimetre-wave radar for a high level of detection performance, the new Camry’s Toyota Safety Sense system features a Pre-Collision System (PCS) with a Pedestrian Detection function, Full Range Adaptive Cruise Control (ACC), Lane Departure Alert (LDA), Automatic High Beam (AHB) and Road Sign Assist (RSA) technology. At speed ranges of between 10 km/h and 180 km/h Pre-Collision System detects objects ahead of the vehicle and reduces the risk of hitting the car in front. When there is a possibility of a collision it prompts the driver to brake with an audible and visual alert. PCS also primes the brake system to deliver extra stopping force when the driver presses the brake pedal. If the driver fails to react in time, the system automatically applies the brakes, reducing speed by approximately 40 km/h or even bringing the car to a complete stop, in order to prevent the collision or mitigate the force of impact. The system is also able to detect potential collisions with pedestrians, in the event of which automated braking operates at relative speeds of between 10 to 50 km/h, and can reduce speed by approximately 30 km/h. Full Range Adaptive Cruise Control helps the driver to keep a safe distance from the car in front. It detects preceding vehicles and determines their speed. ACC then adjusts vehicle speed (within a set range) to ensure that there is a safe distance between both cars. By using the forward-facing camera and millimetre-wave radar in combination to monitor vehicles merging into or out of the lane ahead, ACC helps maintain smooth acceleration and deceleration while driving. ACC is also capable of low speed following, which includes stop-start driving, at speeds of between 0 and approximately 40 km/h. The Lane Departure Alert system monitors lane markings and helps prevent accidents and head-on collisions caused by leaving lanes. If the vehicle starts to deviate from the lane without the indicators having been engaged, LDA warns the driver with an audible and visual alert, and applies force to the steering to assist the driver in avoiding lane departure. Automatic High Beam helps ensure excellent forward visibility during night-time driving. It detects both the headlights of oncoming vehicles and the tail lights of preceding vehicles, automatically switching between high and low beams to avoid dazzling other drivers. By using high beams more frequently the system enables earlier detection of pedestrians and obstacles. Road Sign Assist helps to ensure drivers are kept informed, even if they have driven past a road sign without noticing. It recognises signage such as speed limits and ‘no overtaking’ warnings, and displays the information on the TFT multi-information screen in the instrument binnacle. If the driver exceeds the speed limit, the system will activate a warning light and buzzer. Thanks to the reduced risk of being involved in traffic accidents, vehicles equipped with Toyota Safety Sense can benefit from lower insurance costsor a more advantageous insurance reclassification. 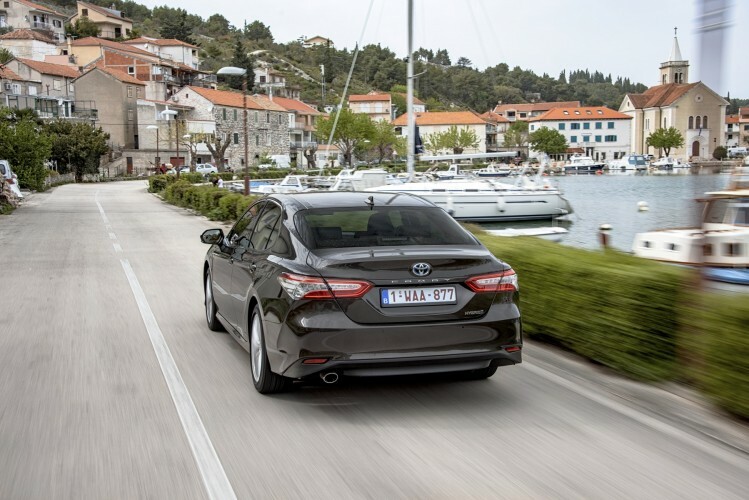 The BSM system uses a rear-facing millimetre-wave radar to detect both vehicles in the Camry’s blind spots and those approaching rapidly from behind in adjacent lanes. It notifies the driver of either situation by illuminating the BSM icon on the corresponding door mirror. If the turn signal is in operation at the time, the BSM icon will blink. The RCTBsystem employs the BSM radar to alert the driver backing out of a parking space to approaching vehicles which may not be visible in either the rear view monitor or door mirrors. When approaching vehicles are detected, the system flashes the BSM icons on the door mirrors, sounds a warning buzzer and indicates the direction from which the detected vehicle is approaching. If the sensors determine that a collision is possible, a brake control system is enabled to mitigate the damage that would be caused by a collision. Intelligent Clearance Sonar (ICS) makes navigating tight parking spaces simple and safe at low speeds. With an arsenal of eight sensors that are located on the front, front corners, rear and rear corners of the Camry Hybrid, ICS will detect objects around the vehicle. When getting too close, it will warn the driver with an audible alarm and even automatically apply the brakes if the driver continues to move closer. Drive Start Control (DSC) helps to prevent unintended or abrupt vehicle starts whilst the driver is operating the transmission shift lever by suppressing drivetrain power output and issuing a warning to keep vehicle speed and acceleration below a predetermined level. For example, if the driver has the accelerator pedal depressed whilst shifting from Park to Drive, the system will automatically limit power output to help avoid unintended acceleration. The Brake Control System combines numerous advanced braking technologies and features that provide an increased level of safety, performance and enhanced vehicle stability. These include an anti-lock braking system (ABS) with Electronic Brakeforce Distribution (EBD) and Brake Assist (BA), Traction Control (TRC) and Vehicle Stability Control (VSC), and Hill-start Assist Control (HAC). EBD ensures that the most effective brake force is applied to each wheel, according to road conditions and vehicle load. By preventing the wheels from locking, ABS helps to maintain sure-footed stability during cornering and braking. TRC monitors and controls the amount of power that is applied to the road through the car’s wheels. If the system detects that one or more wheels spins, it instantly determines the best way to restore traction to that wheel, either by decreasing the power being sent to the wheel that is about to spin or, in more extreme cases, momentarily braking the wheel until it regains traction. The new Camry Hybrid’s body structure has been designed to absorb front, side and rear impacts, dispersing collision energy to help prevent deformation if the high-strength cabin area. Frontal collision energy is dispersed along multiple paths thanks to the addition of a second front member which has been added below the side member. This both increases load absorption from the initial impact and enhances the efficiency with which the energy is absorbed and dispersed through the body structure. The body has been designed to absorb severe side collision impact forces. This is the result of material and design improvements which include the use of high-tensile steel in the front door beltline, larger diameter impact beams for both the front and rear door, and high-tensile steel sheet metal for the roof cross-reinforcements. Within the high-strength cabin, the construction of the upper B pillar mitigates the impact of the head of the occupant due to secondary impact against the vehicle interior. And, similarly, the front and rear door panels are structured to mitigate the impact of the occupants’ lower back against the side of the vehicle. The vehicle’s rear structure incorporates strengthened rear bumper reinforcements, the use of high-tensile sheet steel for the rocker inner, rocker inner reinforcements and rear side members to enhance the Camry’s excellent rear collision performance. The use of a newly developed, ‘floating-island’ bonnet inner structure and a cowl louvre impact absorbing structure contributes to first class pedestrian protection performance. The floating island bonnet inner structure helps reduce the inertia G forces at the beginning of a collision, and combines with a cowl louvre impact absorbing structure to mitigate head injuries. The new Camry hybrid is equipped with a full range of SRS airbags; driver and front passenger airbags, a driver’s knee airbag, front side airbags, and full-lengthside curtain shield airbags. All five seats feature three-point, ELR (Emergency Locking Retractor) seatbelts. The ELR is designed to lock up the seatbelt when excessive load is applied over a preset value. Driver and front passenger seatbelts further benefit from a pre-tensioner and force limiter function.